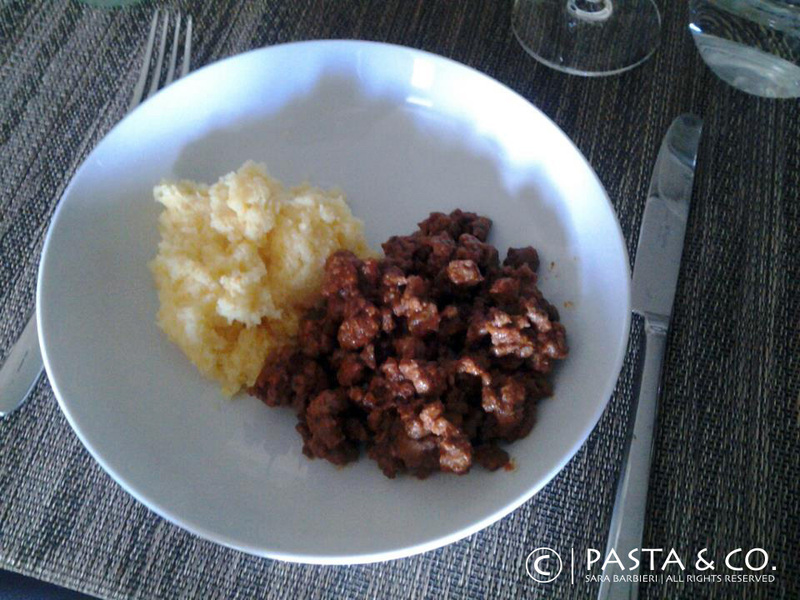 Polenta & Bruscitti | Pasta & Co.
Polenta e Bruscitti is the traditional dish of my hometown, Busto Arsizio. The “bruscitti” are little squares of beef, which are pan-seared with butter and lardo, flavored with garlic, wild fennel seeds, a medium-bodied red wine (Barbera, Nebbiolo or Barolo) and slowly cooked over low heat. Lardo is an Italian cold cut made by curing strips of fatback with rosemary and other herbs and spices. The most famous lardo is from the Tuscan hamlet of Colonnata. Another well-known kind of lardo is the Lardo d’Arnad, a DOP specialty food from Aosta Valley. Both superior types of lardo may be served very thinly sliced as an antipasto with focaccia and pane fritto. “Bruscitti” means “crumbles” and looks back to the peasant and frugal origin of the dish. In those days, meat was not something you could eat everyday. The finest cuts (behind the head and before the tail) went to the rich people. All the others got to eat waste cuts such as the head, the tail, and the innards such as tripe, intestines, and lungs. When cuts like shank and fore shank became available at an affordable price, the poor would debone and lard them to cook beef stew or pot roast. Nothing was wasted. The non-edible parts were turned into sauces and eaten scarpetta style (p. sk-ah-r-peh-t-t-ah), wiping up the drippings with hunks of bread (or polenta in this case). 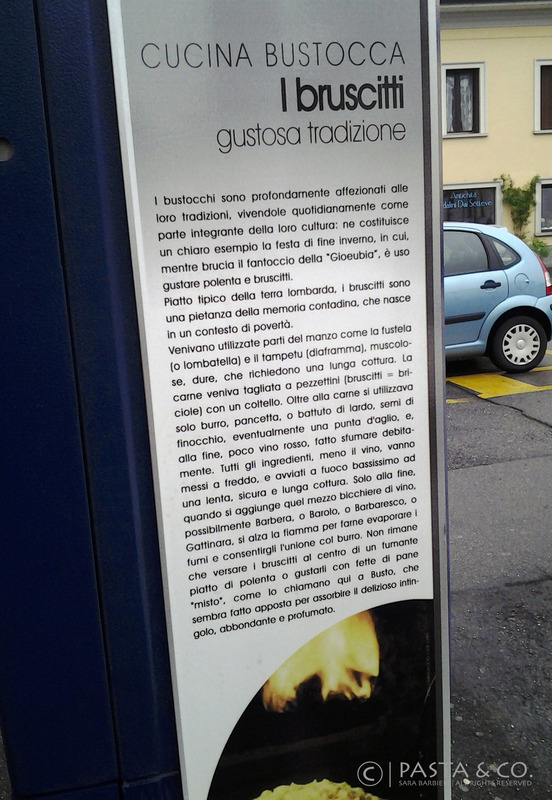 “Polenta e Bruscitti” has always been a matter of pride, mastership and copyright. The original recipe has been entrusted to a notary, and the Magistero dei Bruscitti da Busti Grandi (Busto Arsizio’s Magisterium for Bruscitti), founded in 1975, is a sort of Chamber of Commerce promoting and fostering knowledge about the rustic local tradition. The tradition is even explained on the parking meter (see pic)!! Pasticceria Campi, a premium local pastry shop established in 1887, even invented a sweet alternative, whose recipe is secret since the 1950s. It is basically a sponge cake filled with chocolate custard, chocolate drops, whipped cream, a few drops of sweet liquor and coated with a thick layer of yellow, almost gummy custard. Bruscitti all around the polenta are made of hazelnut and almond brittle. The pâtissier even sprinkles chocolate powder on top, to recreate the burning. See photo here! Let’s get to the recipe, then! My personal treat: 2 cups of fresh tomato sauce. That’s why my bruscitti are red and not brown. To fasten thing up, you can opt for some good 10-minutes polenta and follow the instructions on the box. 2) Place the butter and lardo in a 4 qt pot. When the butter is melted and the lardo starts to fry, pour in the chili meat. Season with salt & pepper to taste and add the little aromatic bag. (When meat is frying, I usually add 2 cups of fresh tomato sauce). 3) Cover with a lid and let it cook for 45 minutes over low heat, gently stirring now and then with a wooden spoon. 4) Meanwhile, prepare the polenta. Put 6 cups of salted water in the paiolo. Add 1 tbsp of olive oil and bring it to boil. When the water is boiling, whisk in the polenta and stir continuously. The continual stirring helps the flour dissolve smoothly in the boiling water without clumping. Cook and stir until the mixture returns to boiling. Reduce the heat to medium-low and continue to cook for 25 minutes or until the mixture is very thick and soft. During the cooking time, the flour will soak up the water and become thick. The polenta is done when it peels easily off the sides of the pot. 5) Meanwhile, grill the bread and keep it warm in a napkin wrap. 5) Bruscitti should be ready. Remove the aromatic bag, increase heat and simmer with red wine until reduced. Serve hot with creamy polenta and enjoy! Polenta is something you can really handcraft like clay. Soft silicone molds, ramekins and even cookie or pastry cutters can help create flans and nice shapes to match your favorite recipes. For instance, polenta e bruscitti can be molded as a yummy little pound cake with the meat on top (whose juice would come down from the little hole, flavoring polenta). Polenta Torte w/ Toma can be a delicious alternative for cheese lovers. See more traditional ways to cook polenta.